Have you ever seen the book Gator Pie ? It’s a cute little children’s story about two alligators named Alvin and Alice who come across a pie in the swamp and plan to share it, but more and more gators start showing up and wanting their own fair share. Essentially it’s a non-threatening way of introducing fractions to kids, with pie and reptiles. I was bound and determined to celebrate Pi Day (today, 3/14, for those of you without math geek tendencies) with an actual pie this year. Since Gator Pie is out of print and I couldn’t get my hands on a copy to remember just what sort of pie all those alligators were fighting over, I had to come up with another alternative. I considered taking another crack at my great-grandmother’s recipe for butterscotch pie: my mother, grandmother and I have all been trying unsuccessfully to make it for years. It always tastes great, but has the consistency of creme anglaise, which doesn’t work so well when you’re trying to cut it into slices. (I suspect we were all using milk with a lower fat content than she did.) That will have to wait for another day, though; butterscotch is not Jeremy’s favorite, and I’m not about to consume an entire pie on my own, even if I totally could at this point in my pregnancy. Actually, the last time I asked Jeremy what he had been craving in terms of desserts, he asked for a chocolate coconut pie, and I just so happened to have some undedicated egg yolks crying out to be custardized in the fridge. Sounded like fate to me! 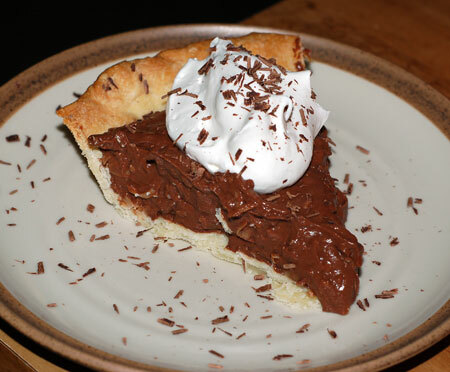 There are a few different ways of approaching chocolate coconut pies: One of these days I’ll have to make a haupia pie again, for the blog’s sake, but I knew Jeremy was thinking more along the lines of the German chocolate pie from Marie Callender’s, which is awfully tasty too. In the end, I settled on Dorie Greenspan’s chocolate cream pie recipe because it used up all those yolks. Dorie actually has a chocolate-coconut variant with flaked coconut simmered in cream until it gets all thick and gooey, but I didn’t have quite enough cream on hand, so I just tossed coconut right into the chocolate custard. This pie was delicious and easy as—well, you know what—to make. I started out the day before by making up some pate brisee from my usual recipe (I believe it is the Martha Stewart one, which works pretty reliably but produces more of a tender crust than a flaky one) in the food processor. I love making crust by hand with my pastry cutter, but it tends to take me so much longer than when I use the Cuisinart that the butter starts warming up. On the other hand, with the latter, you have to make darn sure that you don’t over-process, which can happen in the blink of an eye. The little disks of dough rested overnight in the fridge, and got the usual blind-baking treatment (pricked with a fork, weighted under parchment paper; baked at 375F for 15 minutes, then weights removed and the crust continued baking until golden). While the crust cooled, I whipped up the filling, using Ghirardelli bittersweet chocolate chips and adding a big handful of coconut at the end. I took Dorie’s suggestion of an ice bath to speed cooling time, piled it in the crust, and that was that! Chocolatey-coconutty goodness with a dollop of fresh whipped cream! I personally think it was better than the Marie Callender’s version, because it was super-creamy and not too sweet. If I were an alligator, I would definitely fight for a slice. Bring the milk to a boil (I heated mine in the microwave). Meanwhile, in a large heavy-bottomed saucepan, whisk the yolks together with the sugar, cornstarch and salt until well-blended and thick. Whisking without stopping, drizzle in about 1/4 C of the hot milk in order to temper the yolks; then, still whisking, add the remainder of the milk in a steady stream. Put the pan over medium heat, and continuing to whisk constantly, bring the mixture to a boil; boil for 1-2 minutes, then remove from the heat. When ready to assemble the pie, whisk the custard vigorously to loosen it up and spoon into the cooked pie shell, stopping just short of the rim. Smooth the top and serve chilled slices with a dollop of freshly whipped cream. Source: Very slightly adapted from Baking: From My Home to Yours by Dorie Greenspan (p. 352-353). This post is my entry for Kitchen Parade’s Pi Day event. I love pie, and don’t make it nearly often enough, so I’m very excited to try some of the other recipes submitted. I’ve never seen the book, but I’d love to see this pie on my table!! That just look wicked! I love it, but I fear my waist would not! i think I will keep this recipe for a special occassion! Oh my, what a drool-inducing photo! I love the addition of coconut … That must have tasted fantastic! Deborah, it’s a very cute book. I’m lucky my mom is an elementary school teacher and still has my old copy at home! Tania, I never could resist the combination of chocolate and coconut.